Death and taxes are not the only certainties in life. The interview command, ‘Tell me about yourself,’ is just as much of a foregone conclusion. And perhaps as predictable are a range of head-scratching, almost humorous answers to this directive. Here, I would like to provide ‘Tell me about yourself examples’– from the good, bad, and the downright ugly. This candidate has put himself at an immediate disadvantage, even if the position is to serve as an accountant. The interpretation of the interviewer’s inquiry centered on personality. When you’re talking about yourself to the interviewer, you can provide a glimpse into your mindset/heart/soul … only a glimpse … but it’s best to focus on your work experience, and even your education, if applicable. Candidate B also does not handle this opportunity for self-reflection / expression well. She begins with a soliloquy about all her accomplishments, from the time she was in elementary school to life after college. She does not come up for air and she asphyxiates any chance of landing a job by her runaway-train style of communication. She is giving way too much information, and much of it is not relevant to the position. The interviewer smiles hearing the response, out of courtesy and the knowledge that she has just narrowed down the candidate pool by one. Candidate C’s response will make it more unlikely for him to get to the point of signing any employment papers: ‘I don’t know what to say,’ he offers, after hemming and hawing for what seems like an eternity. While I really empathize with this candidate, the purpose of my article, ‘Tell Me About Yourself Examples,’ is to provide a framework in which to structure a meaningful, intelligent response. Regardless of your exact answer, you’re engaging, friendly, and professional. You need not detail all your strongest points in this ‘Tell me about yourself’ directive. Your answer should not be too short (one sentence) or too long (2-3 minutes is ideal). Your response is built around what you perceive as the general employee qualifications for the job and/or the job’s demands. Show a little personality, but the brunt of your answer centers on the attributes and skills you bring to the job. Upon first analysis, the response is fine but could be sharpened. This applicant offers no detail about past work experience, or insight into the employer. He is commended, however, for not digressing and framing a response around the prerequisites to do the job. (Opening) ‘From my earliest memory, I’ve been fascinated by numbers. My mom once told me that I learned the numbers 1-100 before any letters of the alphabet. Numbers always made sense to me, and appealed to my logic and reasoning. (Transition and Elaboration) This has served me well in my bookkeeping career. I’ve worked over 15 years at Bookkeepers Anonymous, in charge of clients’ financial records. I was responsible for the finances of our largest client – a company that had over 1,000 employees. I did their entire books – everything from accounts payable to accounts receivable, from tax report preparation to employee payroll management. I’m now prepared for a new challenge, using accounting software to process journal entries, online transfers and payments. I’m especially adept at Excel which is what your company seems to favor. Hopefully, the above tell me about yourself example will reveal some best interviewee communication practices. You should, of course, be able to tailor your answer to fit your specific experience, and the job/employment you wish to secure. The next time an interviewer gives you the old ‘tell me about yourself’ prompt, you’ll know what not to say and what to include. Please don’t be fooled if your interviewer frames the inquiry differently, such as ‘Tell me something about yourself that’s not on your resume.” You’re still going to provide a structured answer, following the above parameters. 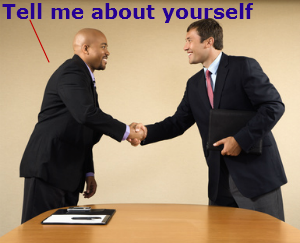 You’re now on your way to properly talking about yourself and talking the prospective employer into hiring you!